I’m attempting to write this entry in ten minutes because I have lots to say and it’s past my bedtime. Since the rumored “cleansing” a few weeks back, I’ve seen very few street dogs, minus the dead one on the end of my road. Fortunately, the body was removed after two days, which was somewhat shocking considering the way things are normally done here in Egypt. One of the Korean staff members began shouting at an Egyptian man who she’d been speaking with earlier. The shouting turned into kicking and hitting, the man escaped onto the street, and the woman, still enraged, followed him out. The rest of the staff followed, leaving six silent customers sitting awkwardly in the restaurant. Once the woman returned, smiling, we figured all was okay. Sarah and I left, only to walk into three Egyptian children strangling their smaller friend, whom they discarded on the sidewalk. The kid was choking and gasping for breath, and it was frightening. We walked quickly on, and passed the Egyptian man from the Korean restaurant further down the road, sitting on the curb on his cell phone. Tomorrow is apparently Robert Burns Day or, as Sarah delightfully told me, “Robbie Burns Day.” The Scottish expats will congregate and read Burns’ poems and sing songs while indulging in drink. Why don’t we have this in the US? I suggest a “Robbie Frost Day,” where we read poems and drink beer. Only Robert Frost didn’t pen a popular New Year’s song, so I guess there won’t be much music. My brilliant schedule has mutated. I have no free time anymore. I teach almost all day straight, running around the building to meet my classes on time. This is bearable, but it becomes unbearable when parents randomly show up at your office during your ONE prep period to ask you why an assignment that was due YESTERDAY hasn’t been posted on the online parent-teacher program yet. You can bet I was counting numbers in my head and mentally beating a punching bag while trying to smile politely. In addition to the 5th grade – too young for me, too needy, but sort of cute in a mangy puppy sort of way – I have also picked up one drama class and will be co-running the drama club after school on Tuesdays with Susannah. Have you seen my energy? Because I haven’t. Looks like I’ll be upping my coffee dosage. For the fifth time, Egypt is COLD! It is cold here. Not outside so much, but inside. To remedy this, Susannah and I turn the heat on full in our office. Apparently, this is no good. We’ve been told by many a matron that we’ll get very sick if we do this. I think they’re going to cut off our heat soon because a matron told us today that it is “too hot in here,” and a memo was sent around the elementary classes to only turn the heat on for five minutes to warm the room. And the nurse came by yesterday to tell me to open a window. I have been wearing my long-sleeve thermals to work every day because it doesn’t matter what I wear anymore; I never take off my coat and scarf. My new favorite phrase comes from Simon (no surprise there), and I’ve been wanting to use it more often. When people act ridiculously, I enjoy calling them crazy in Arabic, which sounds like magnul. Simon simply says they’re “away with the fairies.” I like that. In 2008, I lived in Croatia for two months. The Giants and Patriots went to the Superbowl, and the Giants won. Here I am in Egypt, in 2012, and guess who’s in the Superbowl? Same teams, same time difference. This time, I’m going to try and stay up and watch the Giants win. That’s how it’s going to go, right? As an extra credit question on my students’ ‘ped’ quiz, I asked them to name a word using the root word ‘ped’ that was not on our list. Some wrote ‘pied,’ which was good, or ‘pseudopods,’ which was also good. Some made up words and openly admitted that they had made them up. 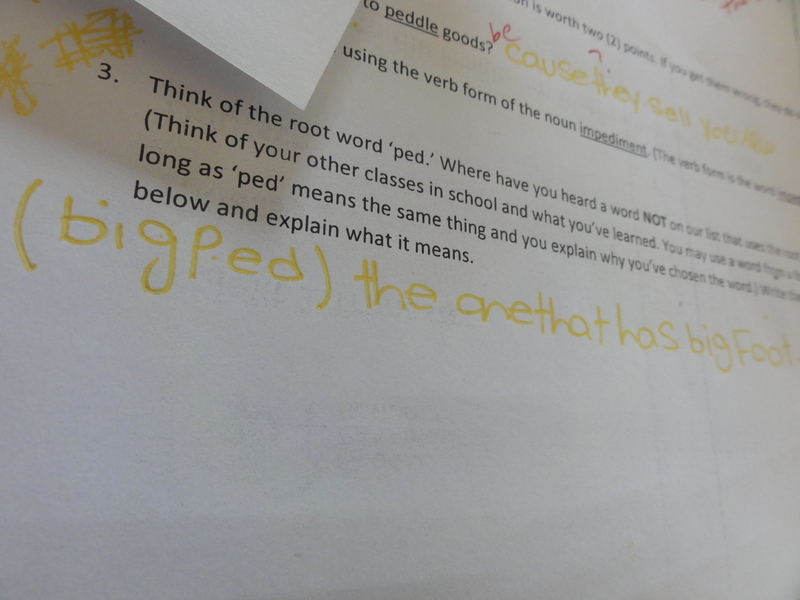 But my favorite was “bigped,” partly because it sounds hilarious, and partly because the student confidently wrote that a “bigped is a big footed creature.” I admire creativity, hey, she knew the meaning of the word. And there you have it. Ten minutes worth of potpourri. I’m off to bed.